It’s been rather a few years since I last listened to Magnum, a band pretty familiar to me from my youth in Birmingham, where they were a steady fixture and a perennial support, but gradually after many years built their own loyal fan base. I kind of lost touch with them around the time of the 1994 Rock Art album and afterwards where I felt that they were just repeating themselves, with lesser returns. So this new album comes fresh to me and now I can again acquaint myself with their delicate shade of Pomp Rock and I have to say that this is impressive stuff. In the time since I last encountered them the line-up has changed with only singer Bob Catley and guitarist Tony Clarkin remaining from the original band, but the new guys fit in seamlessly and this material is a very strong set, opening with what is bound to become a future Magnum classic Peaches And Cream. Tony Clarkin is always an inventive lyricist and these songs are no exception, but also these are longer than usual, giving the music room to breathe and develop some different textures throughout. Show Me Your Hands is another memorable track and one that stays with you after hearing it. I recently caught Magnum at HRH Prog IV (2017), where they talked of this new album coming out, but didn’t preview any songs. Their performance however was very good, showing much of their best material and demonstrating that they still sounded hungry and sharp, stoking my interest once again. This album is the result and it shows a band who are not content to rest on past glories but are determined to forge ahead and create new music, and I for one am very glad to see a rejuvenated Magnum hitting the boards once again. It’s also good to hear Tony Clarkin playing a few famously melodic solos as he guides the music. This is a crisp and clear production with great vocals from Bob Catley. 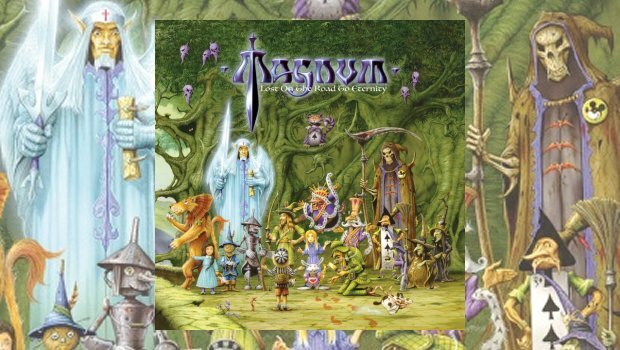 Magnum are a British institution that are well worth revisiting, if you think Magnum having nothing to say in 2018 then listen to this masterpiece and maybe you will think again as Lost On The Road To Eternity is a very fine album, chock full of great songs and strong choruses, one that any self-respecting Prog fan will enjoy. Magnum’s twentieth album is out via SPV on the 19th January 2018. It’s a fine return to form for this classic band and comes very highly recommended indeed.